Centralized backup allows collecting data from remote workstations, laptop units, MySQL and other database servers, virtual machines and other PC, providing an economy of time and efforts as well as flawless backup. 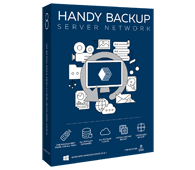 Handy Backup is a perfect example of centralized backup software. A centralized backup system can offer some crucial advantages and benefits when implemented for the enterprise needs. Here are the short descriptions of some most important features provided by a centralized backup system, such as Handy Backup. Centralized workstation backup allows an administrator planning and realizing any backup strategy wanted, from simplest scheduling of data-saving tasks to complex schemes with many well-developed cases and events for each home or company PC included in the strategy. With a centralized backup system, no need to teach each user how to back up can emerge, anyway. An experienced administrator using the centralized backup software will plan and make all operations needed, significantly reducing a risk of loss or erratic backup actions from unskilled users. The centralized data backup system can save a copy of any data type, such as backup a SQL-based table, a disk image (including Linux drives), a website or other FTP content, or a virtual machine, as well as typical home user data including files, folders and entire libraries – all with a single backup solution. A good centralized backup tool reduces the cost and problems of hardware maintenance, provides greater protection for an information backed up, and eliminates local backup inconveniencies such as loose tape media or HDD/SSD overloading during backup. Many backup options such as versioning, encrypting and scheduling tasks. This set of backup possibilities, along with many other features of Handy Backup, can provide the most effective and comfortable centralized desktop client backup ever available on the market. The program constantly updates the list of backup options, data sources and storages. The Server Network is the best centralized backup solution for your tasks, including definitely all the backup options you may need. Free 30 days of trial usage! To organize a centralized backup, you will need a network-oriented Handy Backup solution, such as Handy Backup Server Network. It allows local and remote backup for servers and PC workstations. Please refer to the User Manual to learn more about the centralized backup tool. Explore the efficiency of the Handy Backup centralized backup solutions just now, by downloading and trying it on a 30-day free trial period! Exclusions: I may want to exclude some file types such as images and .exe's. Is it possible to do so with handybackup? Sure. Feel welcome to explore the 'File filters' option on Step 2 of creating a new backup task.